Circle Game: Duck, Duck, Goose! If you don’t work with kids you’re perhaps not familiar with games for groups of children – the circle game Duck Duck Goose is a classic to have on standby and you can easily fit it into your child’s birthday party. Circle games are perfect for parties as everyone’s included throughout. If they’re aged 4 or over, there’s a good chance they’ve played it before. It’s great for burning off a bit of energy and creates a lot of laughter as the chases happen. If you’re getting the children in a circle for Pass the Parcel then play Duck Duck Goose as well. So how is it played? The children sit in a circle facing each other, and one is chosen as the Fox. The ‘Fox’ walks around the circle in one direction, tapping each child on the head, saying ‘Duck’ each time. The Fox at any point can call someone ‘Goose’ as they’re tapped on the head. That’s when the chase starts. The Fox runs in the same direction it was going with the Goose in hot pursuit. They’re racing to get back to the now empty spot in the circle. Normally, the Fox makes it there first as he’s already standing and knows he’s going to run as soon as he’s said ‘Goose’. 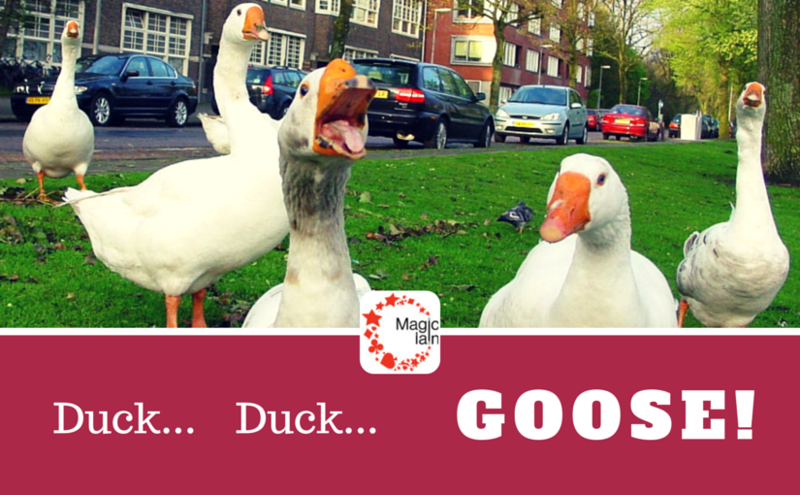 Play continues with the Goose now becoming the Fox, walking around the circle again, Duck… Duck… Duck… until… Goose! Extreme Duck Duck Goose (perhaps for ages 6+? ): the Goose runs the opposite way to the Fox and there’s a face-off as they meet to get to the empty spot in the circle – rules on use of fists and feet need to be applied! Duck Duck Goose is played the world over in slightly different versions. Many involve playing with a handkerchief. The children in the circle stay facing forward. The person walking around the circle drops the handkerchief behind one of them. Once they’ve realised it’s behind them they give chase! In Germany it’s called Plumpssack, and is accompanied by a rhyme sung as the child walks around the outside. The biggest ever game of Duck Duck Goose was played in 2011. It was organised by a school in Missouri. It had 2135 players and stretched all the way round the outside of an American Football Stadium!